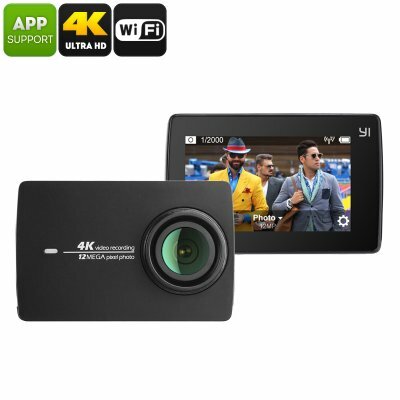 Successfully Added YI II International Version Sports Camera - 4K Video, Ambarella A9SE Chipset, 1/2.3-Inch 12MP CMOS Sensor, WiFi, 155-Degree Lens to your Shopping Cart. The YI II International Version sports camera allows you to shoot stunning photos and videos of your upcoming holidays and outdoor adventures. The gadget packs the Ambarella A9SE chipset along with a high-performance digital processing subsystem and advanced H.264 encoder. Thanks to this, the sports action camera is capable of producing Ultra-HD 4K video at 30fps. If you are looking for a compact high-end camera that captures all your adventures in stunning detail, this gizmo is perfect for you. With its lightweight design and miniature size, you’ll be able to carry it along anywhere you go. It supports up to 64GB storage, meaning there will be plenty of space for you to keep all your video and photos. Automatic image stabilization ensures that you’ll always be treated to high-quality footage. Your camera furthermore automatically adjusts its parameters based on different light conditions. Thanks to this, it will always produce sharp and vivid images no matter the weather conditions. Also, it lets you choose from 9 shooting modes – guaranteeing it will meet your personal filming style. After you have finished your recordings, you’ll be able to share them instantly with your smartphone or tablet through WiFi. With its 1400mAh battery, your 4K camera treats you to 2 hours of continuous usage time.